Jimmy Olsen and Lucy Lane banter in his apartment as Jimmy prepares for an assignment at a facility on the moon: the P.R.O.J.E.C.T.S. facility, where he will become the leader of the think tank for a day for his "For A Day" column. She tells him (jokingly) that they're through, because he was named worst dressed person of the year. On the moon, Jimmy meets with the warcorps soldiers, who introduce him to tungsten life forms. Touring, Jimmy sees a door that reads "Do not open until Doomsday," a sealed door. Agatha, his tour guide, asks him to stay away from the door. She explains that the room contains a stem-cell accelerator that transforms a soldier into an unstoppable killing machine created by Cadmus Labs of the US Army. A super-heavy gravity research room is being manipulated by "Bizarro" techs. Jimmy looks down into the experiment, which promptly malfunctions, nearly sending him into the abyss. Perry tells Clark he's doing good work. He hears Jimmy's peril, makes an excuse, and departs. At the scene, he saves Jimmy, but fails to save the worker who fell in. He tries to recover the worker's experiment, and finds a piece of black kryptonite. Superman seems all right at first, but soon begins acting out, marring the table he's sitting at with Jimmy, and then outright attacking Jimmy with his heat vision. 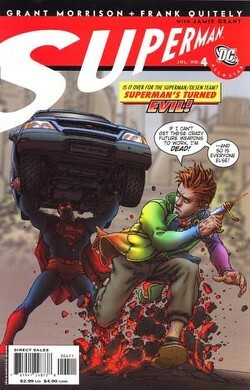 Superman's two failsafes that he created to stop himself fail, and Jimmy takes drastic action, taking the Doomsday serum and becoming a gray, armored version of himself, attacking Superman. Superman attacks back, but Jimmy doesn't feel it. He hits Superman with a blast of vision, and Superman crumples. Jimmy's signal watch goes off, and he reverts to his old self. Producers, having had their lives saved by Jimmy's actions, give him tickets to "Frankenstein On Ice." Jimmy and Superman recover in the facility before Jimmy uses his position to make one last order as his day closes. Returning home, he finds Lucy and shows her the moon, which now reads, "I Love Lucy." Story - 4: Much better than the last issue, as far as I'm concerned. The problem with the last issue was the way that Superman acted out of character, taking unnecessary and dangerous risks even for the "Silver Age" Superman this appears to be based upon. There are still issues with this series, a NUMBER of them, that bother me on a visceral level. Having issues out on time is a big one. It's harder to enjoy an issue if you can hardly remember what happened in the last one. For instance, I had to look back to see if the whole "Superman is dying" thing was resolved. Call me lazy, tell me I'm a bad fan, but if I had to do that to know what was going on, and if I only did it because I was reviewing the issue, chances are other fans are falling into the lurch with things like that, and these things add up, ultimately causing people to drop a title. The story remains, per the series as a whole, a celebration of the innocent Superman, the scientific, crazy, zany, old school Superman that I'm personally beloved of. I've been saying for years that there should be a Silver Age style Superman book out there, and this is it. I don't know why they're giving it the "Ultimate" feel and not just calling it Silver Age (because that's basically what it is), but I'm still enjoying the old flavor. It's especially complimentary with the Showcase Edition Volume Two that I'm reading right now. It's as if those old, classic stories were given the modern polish and allowed to run wild. I love the flavor of this book, if that makes sense. But in a modern context, you shouldn't be able to shoot holes in the plot. Not any more...and there are other things that need repair desperately in this book. First, the NAME problem with the dialogue. I mentioned it last issue, but last issue it was only for a few pages. Here, it's constant, continuing, and annoying. Scan the dialogue. In dialogue, sometimes you MUST label who is speaking. For instance, the first introduction of a character in a scene (though honestly, I can get around that in prose where you CAN'T see the characters, I see no reason to use it in a medium where you can actually SEE and commonly KNOW who's speaking). There is an argument that it is stylistic, and offers the compelling, old-style dialogue. And that's true. But, and I was thinking about this as I read the Showcase edition, if you look at the old books, they DON'T use names this prolifically. Typically, it's just as I mentioned, at the introduction of a character. It's a device used for arbitrary drama, and though you, the casual reader, might glaze over it, it drives me as a writer fricking NUTS, because I know Morrison should know better. It's in, literally, every scene in this book. Jimmy as a columnist is a bit of a twist. He's supposed to be kind of a peon, but in this series, it gives a more rational twist, making him actually contribute to the paper more instead of just being a photographer. I like it, and I don't like it. In this issue, it works well. The biggest, most glaring flaw in this issue is the way that it shows just why we're no longer using the comic mentality of the Silver Age. Doomsday. In this issue, we get the one-issue, simplified, somewhat generic vision of what Doomsday could be. In the regular comics, we got an epic, 40 issue saga involving the creature's arrival, destruction, and resolution through the Return of Superman sage. It forever altered the way comics were looked at and gave us all a benchmark. If that story had been done forty years ago...this is likely what it would have looked like. And compared to that saga, it's nothing. As an issue, it's kind of neat. But when you put it in perspective, it just points out why the shortened, digest, single-issue baddie-comes-to-town fails on a colossal level in the post-modern world. In an analogous medium, to complicate things, look at Venom. Venom, in Spider-Man, took a period of months, crafted a more edgy Spider-Man, and spanned from the Secret War to Eddie Brock running around and causing Maximum Carnage. It was a benchmark for Spider-Man, and it's something that anyone trying to re-create the Spider-Man universe is going to have to do. That's why Bendis did it in Ultimate Spider-Man, the All-Star line's competitor from the other house. He took six issues (as I recall), spread it out, changed things up, made a few things new (like Morrison did), but the decompression made it a fitting re-imagining of a classic benchmark. Doing Doomsday in one issue does not. That said, was it creative? Was it cool? Yes. Did I titter? Of course. But this issue shows, and helps me realize, that creative is a very good thing, but it does not necessarily mean readable or cool in a modern context. Not as much as, say, "Up, Up, and Away" gave a vision of the modern Superman/Luthor battle, even though it's a story that's been done before, like Doomsday. That and the fact that if they took even two issues to tell this story currently, it'd take roughly six years to hit the stands (grumble grumble, meet your deadlines). And before I get a letter that says, "Neal, meeting deadlines is hard! Show a little sympathy! ", I would simply reply to the artist and the company: Only commit to what you can accomplish. It's why I tell people it'll take me some time to answer letters when they send them to me, but I haven't missed a review without extreme circumstances in six years. When people depend on what you say, when people care about your product, it's not only the artist's responsibility to get the work out in a timely matter, it's also a reflection on the work, which is unfortunate. The Perry and Clark scene seemed thrown in and not essential to the story...and it highlighted the fact that Superman heard somehow through space and to the moon, which is a little beyond my suspension of disbelief. Black K was used creatively here, as a way to introduce Bizarro. But what, now, no Bizarro beyond Supes? That's too bad. Also, I don't know about you, but I'm getting a little black K overload. It's still undefined as far as what the heck it does (beyond showing the random dark side of a personality somehow, but how's that different from what red K could do?). But here, it's interesting, and cool, and I like it. Typo (as I see it): "Not anymore since I became immune to green K, Jimmy." A comma after anymore? (Implied "not" before "since" requires it, right?) Meh. I only got to third grade. Also, what about Doomsday overloading Jimmy's mind? Why didn't it? And why did the signal watch go off? Loose ends that aren't made clear to me, and I was watching. This is one of those cases where I go off on a litany of the plot holes and all of the things involved that I note, but please understand, that's just what a reviewer does. As those who know what I do understand, I find these things, I point them out, but I still rate based on my gut, and honestly, all that aside, this wasn't a bad book. It was fun, it re-imagined the concepts I hold dear and came out smelling like roses, and it's still rolling along. The CONTEXT of the book and the fact that it is a new Superman book requires my lengthy above analysis, but honestly, as far as all things go, when this book comes out, and when it's not making Superman mock a sentient creature's lungs exploding, Morrison's delivering the goods (four times yearly). Art - 5: Quitely contiues to impress me with his rendition of Superman and the characters involved. I did notice a distinct lack of background in the early pages, but as the story moved on, background built, and I realize that though that's often used as a time saving device by artists, if you look at the book as a whole, it's always tonal, it's always apt, and he uses it stylistically, which is respectable. I enjoyed it a great deal. Give an artist the task of drawing a Jimmy Olsen Doomsday, and see how many are this cool. I dare you. Cover Art - 5: As I mentioned above, it's hard to take something in a modern context and rate the Silver Age version of it and still be fair. Normally, I'd rip something apart for having words on the cover, and cheesy ones. But hey, this is a Silver Age homage, so it works, and works well. It happened in the story, it embodies the spirit of the story, and it's incredibly dynamic. Good stuff.